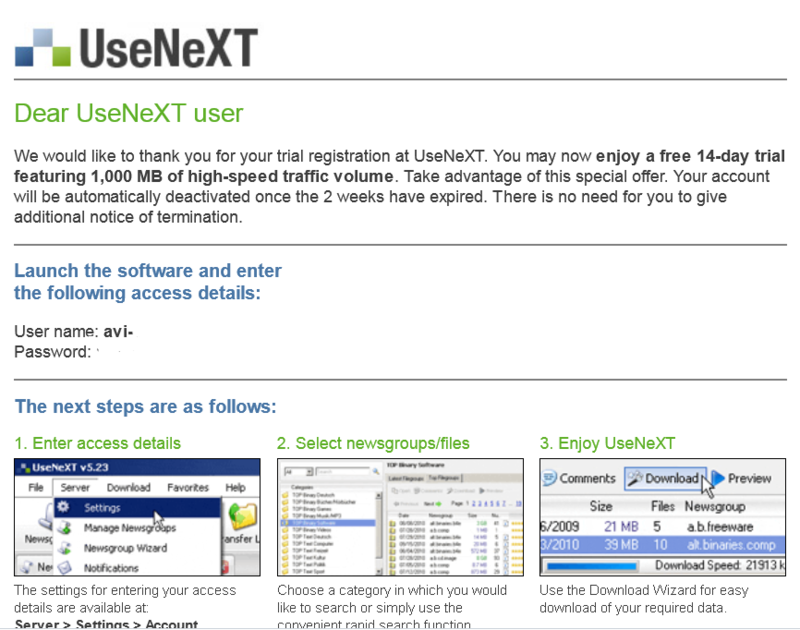 Download 1 GB For Free From UseNeXT - Without Signing Up! Over 6.000 Terabytes of files available, including almost any movie, album, TV show or game / software ever released.. Maximum speed: Download everything in a matter of minutes (just check the example above). Total privacy: No one keeps logs of your downloads, so everything you do is absolutely safe and encrypted with SSL. However many people hesitate to jump right in and signup for a free trial or paid account, since they have not been able to get a feeling for how it works. No wonder: Who wants to enter their payment information for something they haven’t even tried yet? Maybe you’ll in this group too, and we can’t blame you for being kinda reluctant to do that, and no worries: We got you covered! During our research for our articles series on Usenet downloading, we found several providers offering free trials, and they usually divide into two categories: Some require you to enter your payment information and then allow you to download a limited amount of data before turning into a paid subscription after one or two weeks, while some don’t require more than your email address but only provide heavily restricted speeds. However, there is another way, which you won’t find that easily on the Internet: reputable Usenet provider UseNeXT (see our in-dept review here) allows you to download 1 GB for free at full speed, while only needing your email address with no strings attached. A very cool option indeed, and it allows you to test drive the whole thing without worries. For those of you worried about viruses and adware: you will see that the link redirects you to the website of Twinplan.com after clicking on it, a company associated with UseNeXT, which guarantees it will be clean of malware of any kind. In case you want to share this link with a friend, please redirect him or her to this article, as this “free trial” version of the software is not directly available on the services website – you can only claim the “large” trial there, which requires you to enter your payment information. This will take you about 30 seconds: Run the installer and install the software to your hard drive. Afterwards, start up the software and proceed to step 3. Now, as soon as you’ll try to download something, UseNeXT will ask you for the login data. And there you go: feel free to explore the Usenet and experience the speed and the impressive amount of stuff to get. Just try it out and have fun with your new favorite way to download files! And here is an additional tip: If the search engine doesn’t work too well for you, just use Binsearch.info to find anything you need. It works just like a torrent site, just that the torrents are called NZBs.